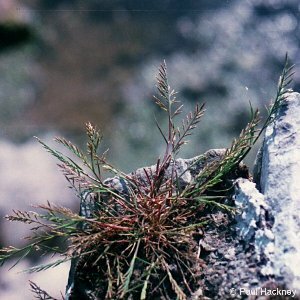 The English name for this grass comes from the vague resemblance of the inflorescence to a fern. It is a species of dry rocky outcops and walls, avoiding acid rock. All names: Catapodium rigidum (L.) C.E.Hubb. ; Desmazeria rigidum (L.) Tutin; Desmazeria rigida (L.) Tutin; Poa rigida L.; Sclerochloa rigida (L.) Link; Scleropoa rigida (L.) Griseb.